Produced by MD Productions ‘Aatish‘ is the new prime time drama serial on Hum T.V that airs every Monday. The drama serial has been written by Shagufta Bhatti while Saima Waseem has directed it, it stars Azfer Rehman and Hina Altaf in the lead roles of Sheheryar and Asma respectively. What attracted me to watch this drama was the catchy OST. Hassan Munir’s composition along with Sabir Zafar’s lyrics and Ali Tariq’s voice give the sound track a very soulful touch worthy of a love saga. The drama revolves around Asma (Hina Altaf) who was left at the house where her mother worked as a maid when she was just a baby. Asma’s father was an alcoholic and her mother was scared he might sell baby Asma some day just to get some booze so out of that fear she left Asma with the lady (Azra Mansoor) she worked for. Asma calls her Ammi and even though she knows she is the daughter of the maid who worked at this house previously she still considers herself part of the family. Azra Mansoor assays the role of lady of the house really well she is kind and wise and basically everything you expect a granny figure to be. Ammi lives with her son Saad (Aqeel Abbas) and daughter in law Nazia (Madiha Rizvi) Anna bee and her grand son Hadi. Asma is portrayed as a very immature and childish character but then again that could be Asma’s coping mechanism for dealing with her past trauma. Asma regards Saad as her elder brother and Saad Bhai also considers her a part of the family which is why he is always invested in her studies. He keeps encouraging Asma to study and make something of her life but Asma finds it hard to focus on her studies and that’s what Asma’s days revolve around working, taking care of the family and struggling with studies. Unlike Ammi, Saad and Hadi Nazia treats Asma mostly like a maid. Things go a little berserk in the family when Naureen Appa (Saba Hameed) who is Ammi’s eldest daughter comes home from America. Naureen’s husband died because of which she had to raise her two sons Salar and Sheheryar (Azfer Rehman) alone. It is established that Naureen lead a tough life alone in a foreign land and raised the two boys to be successful independent men. The reason behind this visit to Pakistan is Naureen’s intention of getting her elder son Salar married to her late husband’s niece Maria. Salar is portrayed to be a very elder brotherly figure who is an obedient son and very affectionate towards everyone on the contrary Sheheryar is the mischievous young-ling who still needs a lot of growing up to do. When the two adult kids Asma and Shehryar meet the results are naturally disastrous. They avail every opportunity of making each other miserable. It is evident that they have started forming an attachment that both of them are unaware of. Because of Naureen’s and her son’s arrival Ammi appoints her house help’s son Saadatmand for extra help. Naureen suggests the idea that since Asma is so pivotal to this household she should be married to someone like Saadatmand who lives and works in this very house so Asma wouldn’t have to leave Ammi ever. Asma is not a huge fan of the idea and for the first time she has started acknowledging her place in this family which is noting more than that of a maid. 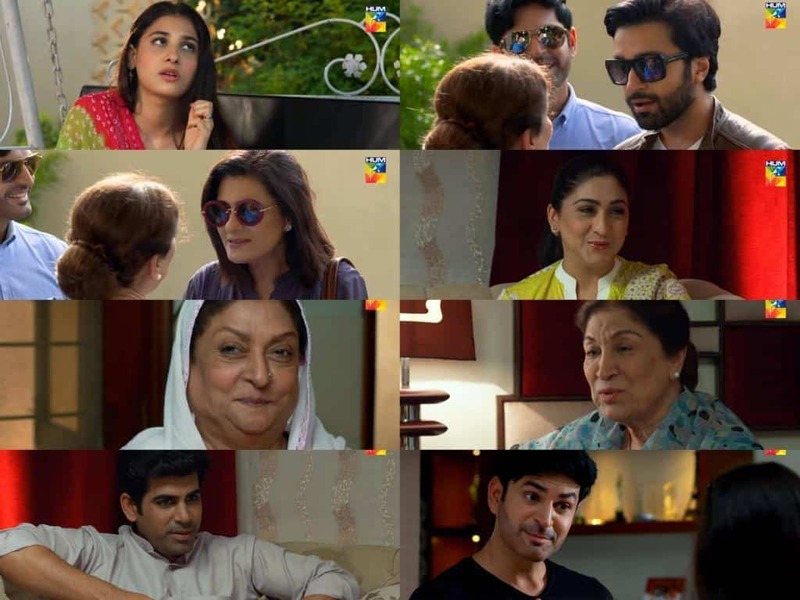 The plot looks predictable so far but we await to see how and when both Asma and Shehryar will realize that despite the differences between them they have both formed a bond like nothing they have experienced before. Overall the story isn’t something new so it would be a challenge for the entire team to make this drama stand out from the rest of the same genre. Most of the times in Pakistani dramas the portrayal of Pakistani American nationals isn’t convincing enough same is the problem with this drama. I understand that the budget and time factors limit the amount of detail that can be worked on in such projects but it’d be nice to see such portrayals done right once in a while. Saba Hameed, Azra Mansoor, Madiha Rizvi, Hina Altaf and even Saadatmand are doing a great job at assaying their roles. On the other hand Azfer Rehman’s portrayal of Shehryar seems a bit forced same is true for the actors playing Salar and Hadi. The soundtrack as mentioned earlier is top notch. I have previously seen Hina in serious roles and this role is the exact opposite of what she has done previously but she surely is nailing it. It’s a good start despite some flaws and we are intrigued to see where this journey takes us. How’d you find the first two episodes of’Aaatish’?